Lynch Pin Kit. 7/16" dia x 1-3/4" L pins. Each pin is spring loaded to ensure a secure hold when installed. Mid carbon steel construction. 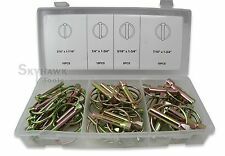 This 25pc Lynch Pin Set is ideal for a wide range of applications where quick fastening and securing is required. Made from A3 carbon steel for maximum durability and strength. Material: A3 Carbon Steel. We are Swordfish Tools, Inc. Our products cover many applications in the automotive, motorcycle, engineering, agricultural, and HVAC industries. We pretty much make it all. Kit includes a variety of common lynch pins (L-pins). 50pc Lynch Pin. Spring loaded with self-locking ring. Maxcraft 7701. This set would be great to have for any tool box. Pricedrightsales was founded in Lincoln Nebraska in 2010 and has continued to grow in size providing great quality products at great prices. Zinc plating for long life includes: 16pc 3/16" x 1-7/16", 18pc 1/4" x 1-3/4", 6pc 5/16" x 1-3/4", 10pc 7/16" x 1-3/4". 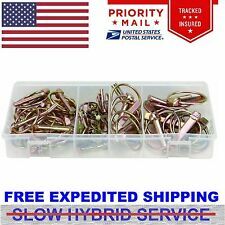 16 Pc - 3/16" dia x 1-7/16" L Pins. 18 Pc - 1/4" dia x 1-3/4" L Pins. Each pin is spring loaded to ensure a secure hold when installed. 6 Pc - 5/16" dia x 1-3/4" L Pins. 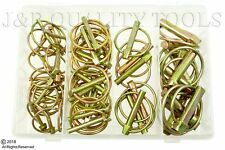 10 Pc - 7/16" dia x 1-3/4" L Pins. Then this is for you. Of coarse I didn't have another one. I learned it is important to have extra hardware when you need it. O, and I never found the missing lynch pin ether. 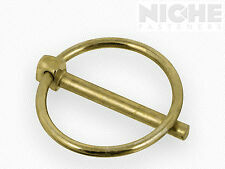 (2) 7/16 LYNCH PINS (Zinc) NO LONGER IN GOLD FINISH. Lynch Pin Washers Cat. #1 Pat's Easy Change System. 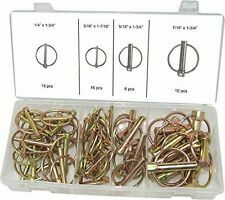 Use with Pat's Easy Change System, Category 1 bent washers. 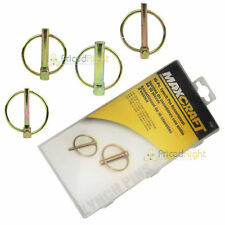 Use these 3-point quick hitch bent washers with your Category 1 quick hitch system with your pins. Lynch pins fit several applications such as securing a wheel on an axle. The lynch pins are spring loaded and constructed of low carbon steel for maximum durability. 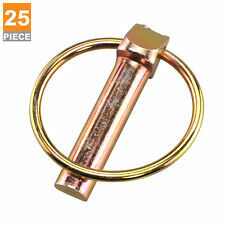 Lynch pin rings are spring loaded to ensure a secure hold when installed. Size:5/16" x 1-3/4". Great for use on 3 point hitches and other frequently assembled and disassembled parts. We will try our best to solve the problem for you. 5 Springs Chest Expander Hand Gripper Exerciser Strength Training Adjustable. Made By GOLIATH INDUSTRIAL TOOL. Great For Use On 3 Point Farm Tractor Hitches. Usable Pin Length: 1-3/8". These are new and have never been use. Small orders are no problem. Quantity Available: 10. Joseph Fazzio Inc.
Zinc plating for long life includes: 16pc 3/16" x 1-7/16", 18pc 1/4" x 1-3/4", 6pc 5/16" x 1-3/4", 10pc 7/16" x 1-3/4". ITEM INFORMATION. ITEM NUMBER Square2Box is here for you!